Labels: Select the column header that contains labels for each row. These labels are in your category-column. We'll choose the column "Partei" for our labels. Groups: You can upload an extra column to put categories into extra group. In our case, we could have a column that indicates if our education are right-wing or left-wing. Each row in this column would have either the text "right-wing" or "left-wing". If we chose that column as our "Groups", the chart would make a separation between right-wing and left-wing parties. 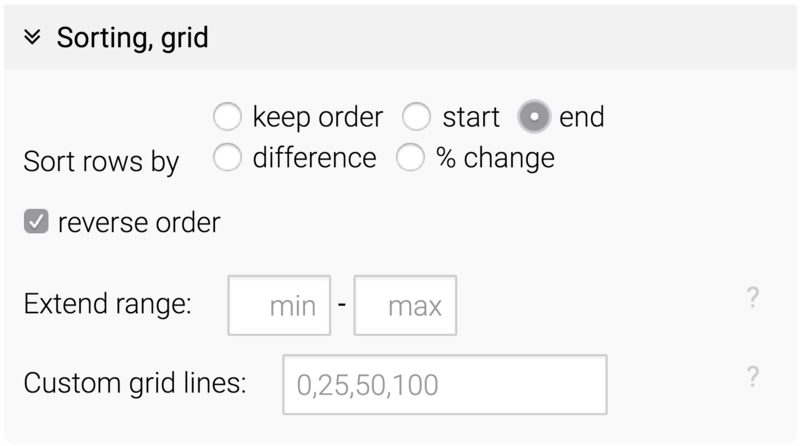 Range start: Select the column header that contains the value of your earlier time point. In our case, we choose the column "2009". Range end: Select the column header that contains the value of your later time point. In our case, we choose the column "2013". The order of our rows: How should the lines and labels be sorted? You can keep the order of your spreadsheet, or you can sort the lines by the values of the start date (2009, in our case), by end date (2013), by the difference between the start and end date or by the percentage point change between the start and the end date. In this panel, we can also decide if our chart should have a color key or not. 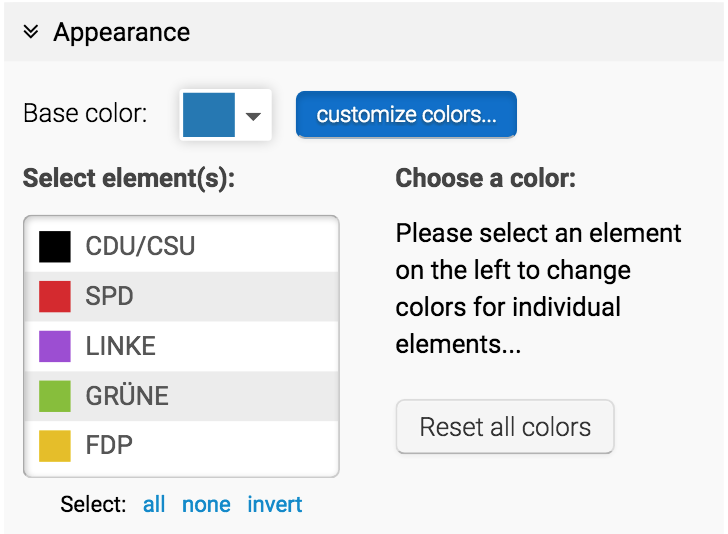 If we click on the text field next to a color, we can also change the description. Our colors are intuitive for our German audience, so we decide against a color key altogether. Label values: Here we can decide if you want values to be displayed next to the arrows, and which ones you want to display. 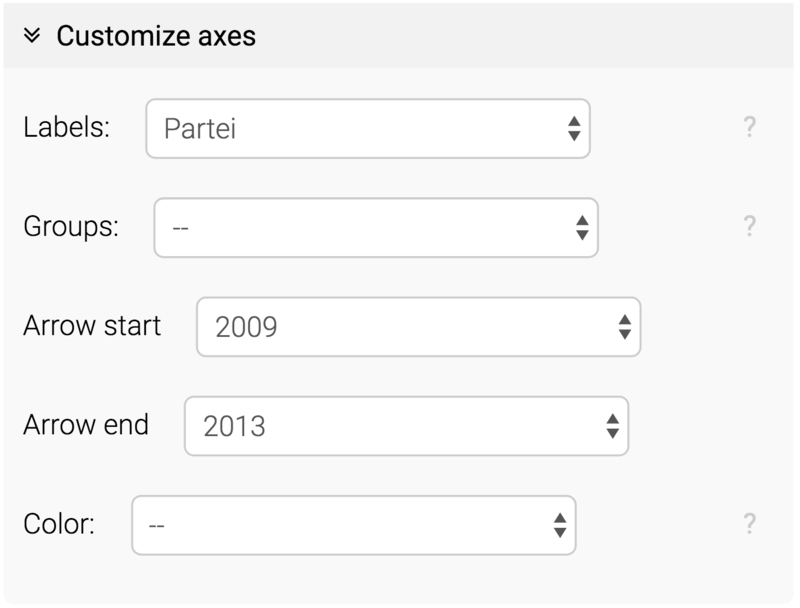 You can choose to display the values from your columns with "start", "end" or "both". Our Datawrapper can calculate the difference or the change in percentage point between the two values on each line.